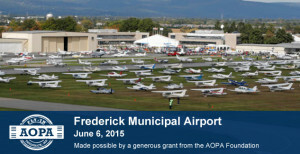 Join AOPA and your fellow pilots and aviation enthusiasts for the AOPA Fly-In at Frederick Municipal Airport on June 6, 2015! A celebration of general aviation, their grassroots gathering features something for everyone with exhibitors, aircraft displays, seminars and activities to interest and delight your entire family! Like last year, AOPA is expecting record attendance so RSVP today to reserve your meal tickets and save money. And, when you RSVP early*, you’ll be entered into a sweepstakes drawing** to win one of the following great prizes. Plus, you’ll receive $5.00 in AOPA Store Bucks and a $25.00 Jeppesen coupon for onsite purchases! The AOPA Homecoming Fly-In at Frederick Municipal Airport will have something for everyone! Spend the day exploring exhibits, ask AOPA President Mark Baker questions at a Pilot Town Hall, eat breakfast and learn something new in seminars! Fly in or drive in to your association headquarters! Come early on Friday and enjoy a special Friday Night Barnstormers Party! The Barnstormers Party on Friday evening will feature a BBQ, bonfire, and a special screening of the new film “Living in the Age of Airplanes.” Filmmaker Brian J. Terwilliger will be on hand to introduce the film and take questions afterwards. Saturday starts off with a delicious pancake breakfast. And what would breakfast be without a steaming cup of Flying High Coffee? To top it off, renowned aviation author and humorist Rod Machado will be on hand to entertain you with his whimsical insights on flying. In the afternoon, enjoy a delicious lunch provided by gourmet food trucks or local restaurants. To ensure they have enough food, please RSVP today to reserve your meal tickets at a reduced rate and to take advantage of our sweepstakes drawing to win one of the prizes mentioned above. And, when you RSVP, be sure to tell them whether you’ll be flying or driving so they’re prepared. This entry was posted in Announcements/News, Events and tagged AOPA, Aviation event. Bookmark the permalink.